Most historic project makeovers you read about focus on structures that are hundreds of years old. 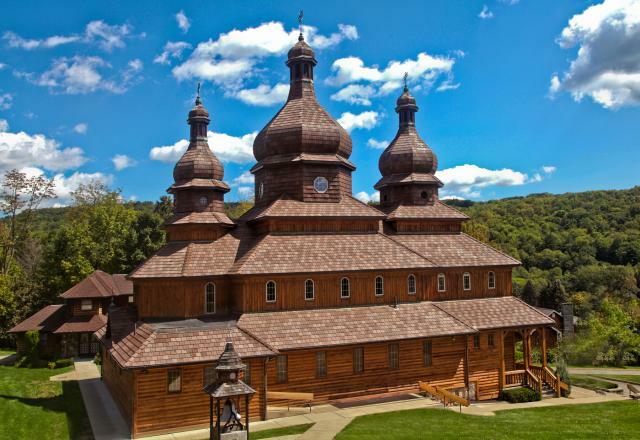 But in Johnson City, New York, the Sacred Heart Ukrainian Catholic Church is just 37 years old, yet it promises to be written up in future history books. That’s because the traditional Ukrainian design of the church structure includes three massive domes. Each one is 80-feet tall — and each one is covered in our single-width Valoré composite shake roofing material from DaVinci Roofscapes. Church founders selected the Tuscano blend of light, medium light, medium and dark autumn colors to top their unique church structure. The shake alternative roofing product was selected after the original cedar shake roof deteriorated. Valoré synthetic shake roofing tiles embrace the art and science of roofing and offer exceptional aesthetics and performance without destroying a budget. The synthetic cedar shake tiles resemble the hand-split shake tiles found on upscale residences throughout the world, but require none of the maintenance. Available in 9-inch tile widths with a deep 5/8″ profile shadow line, Valoré lightweight roofing tiles are Class 4 impact-rated, rated Class A for fire resistance and won’t support the growth of fungus or algae. This 50 year roof offers exceptional value for any residential or commercial project. And that’s a lesson for the history books! For information on synthetic roofing material used on other churches, visit Churches Thankful for Roofs Overhead.